Daytime temperatures in the Alps average in the low to middle 20s (Fahrenheit) above zero even in January. Strong winds don’t last long; they are usually harbingers of a major snowfall. Austrian mountain resorts not only meet the best standards elsewhere, but often exceed them in value and service. As is the Austrian way, service and gratuities are always included. You can ski right into the village, and the lifts are usually within easy walking distance to your hotel. Beautiful, picturesque hotels, with fluffy down comforters and cozy rooms, await you. Along with a hot spicy 'Gluehwein' or 'Schnaps,' of course! Besides its ski resorts, Austria is world famous for its ski-schools and instructors like the legendary Hannes Schneider. He and others have founded ski-schools at home as well as in the United States and in Canada. Ski lessons in English are available from some of Austria's most talented ski instructors. Creating runs for every level skier and making sure that visitors can navigate through the terrain they want to ski is top priority in Austria. That means extreme skiers and beginners alike will find their place on all mountains, with a variety runs to help everyone reach their peak. Though the slopes aren't gusty and bitterly cold, the Austrian Alps are blessed with a long and lavish snow season. The snow on the ground is generally powdery and fluffy well into spring. Packed powder prevails on the groomed runs, deep powder off-piste. The Austria Snow Report gives you the latest snow conditions at the top ski resorts in Austria, seven days a week, from mid-December to late April. The reports are updated twice each week and are reliably gathered by the Austrian Automobile Association. The number can be reached by dialing (212) 944-6880 ext. 993. View the Snow Report online. Austrian ski resorts are typically nestled in valleys.The surrounding mountain tops are artfully carved with long open runs that begin above the timberline and feed into the resorts below. Generally, there are mid-run markers on all Austrian ski slopes above timberline. The color of these markers, 1 foot-diameter disks on poles, lets you know whether you are on an easy (blue), medium (red) or difficult (black) run. Edge markers, large plastic globes on high poles, tell you whether you are inside (green), on the edge (green/red) or outside (red) the run. In addition you will find orientation maps at the lift stations, numbered run designation, danger signs, rope barriers, safety nets and much more. For non-skiers, there's plenty to do and see. Tobogganing, sleigh rides, snowshoe adventures through snowy alpine trails or ice skating are all available at most resorts. There are loads of options for trend and adventure sports like snowboarding and telemarking. Spice up your winter vacation experience with some European flavor: check out the local sights, shop in uniquely Austrian boutiques, take excursions to some of the beautiful surrounding areas and meet the international crowds that love to gather in the outdoor cafes. Austrian ski resorts are built around villages that have been there since the Middle Ages, where the architecture and traditions of the region are integral to the daily life of the community and its visitors. Welcoming friendly faces, delicious restaurants, a sense of history and tradition are at every turn. When you slip into your skis in Austria, you are stepping into another place, another time, another culture. You can't repeat the experience anywhere else. The value of your experience is thus doubled when you ski Austria. Voted "Europe's Flower Village" and twice won "Austria's Most Beautiful Village" contest. Clean air, lush meadows and a picturesque village. Try tasty Tyrolean specialies with a glass of schnapps to warm body and soul. 100 miles of trails. Hike the Wiedersberger Horn at 7,000 feet and routes to abondoned 15th century farms. Visit Rattenberg, glass blowing city from the Middle Ages or Alpbach's farmhouse museum built in 1636. For your stay, choose either the quaint chalet style pension Haus Angelika or the first class Alpbacherhof with indoor swimming pool, outstanding Tyrolean cuisine, breakfast on the sun terrace. Twice hosted the winter Olympics. 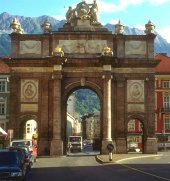 The village sits on a sunlit glacial plateau 3,000 feet above sea level with a view of Innsbruck below. Verdant country, freshwater lake, also a sports resort. Home base is 5-star Sporthotel Igls. Castles, chapels, murals, fountains, flowers, and open air concerts. 120 miles of trails, 25 tennis courts, Aquarena. Home base is 5 star Hotel Weisses Roessl, member of "Leading Hotels of the World". Visit the timeless paradise in the village of Lech at 4,748 feet, a world of peaks and valleys. Old-world culture abounds in the farmer's market, the 15th century Parish Church, and the Sunday brass band in authentic costumes. Cyclists experience the diversity of Vorarlberg's (Austria's most western province) scenery on the bike trail between Bludenz and Bregenz. Surrounded by a majestic mountain backdrop and and nestled between five valleys, the medieval Alpine town of Bludenz is the perfect starting point for this Alpine Adventure. Bludenz can easily be reached via train (closest airport gateway is Zurich) and besides cycling offers great hiking, fishing, shopping. For chocolate lovers, don't miss a tour of the Suchard chocolate factory where the famous "Milka" (thats the purple one you will find in every Austrian store) is produced. The bike trail follows the Ill river to Feldkirch with its medieval town center and the majestic Schattenburg castle. Following the Rhine river north, you will eventually get into Bregenz, known for ist summer music festival perfomances on a floating stage on Lake Constance. From Bregenz you will connect to the international Lake Constance Loop, allowing you to visit Germany and Switzerland as well. If your legs are caving in, you can take a short-cut on the ferry to Konstanz. The loop will bring you back to Bregenz on the south shore of the lake. For added variety, parts of the loop may be accomplished by boat. This may very well be one of the most exciting cycling tours in Europe. 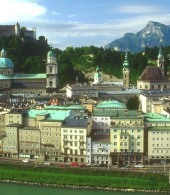 Scenic beauty, Europe's highest waterfalls, a visit to Salzburg and countless attractions along the way. The starting point of this bike trip is the small village of Krimml, inmidst the Hohe-Tauern National Park region. With its impressive waterfalls and some great hiking excursions, it might take you an extra day to leave Krimml and get started on your journey. The bike trail will follow the Salzach River through charming villages to Zell am See, a picturesque summer and winter resort. Here you will have two options for your way to Salzburg, to continue along the Salzach River with a chance to visit the world's largest ice caves in Werfen or the salt mines in Hallein. Or you can take the (even more scenic) route along the Saalach river, visiting such charming places like Maria Alm and Lofer and taking a short cut through Bavaria into Salzburg. From Salzburg the bike trail will lead north through Oberndorf (with the Silent Night chapel) to the German border town of Passau where you may connect and continue to the Danube bike trail towards Vienna. Features: slightly downhill only some minor climbs, mostly on paved trails and or minor roads with local traffic. Some gravel or mountain trails are used (not recommended for racing bikes) . The "Salzkammergut" salt chamber district of Austria, with its many lakes in a beautiful alpine environment, has become one of the most popular vacation spots in Austria. This bike trip will lead you by no less than 13 of these lakes offering you a chance to break up your cycling with swimming, fishing and sailing and hiking. This tour is a loop which allows you to start your adventure anywhere along the route. 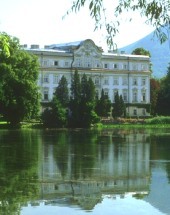 The official starting point is Salzburg from where the route will follow southeast to St. Gilgen on Lake Wolfgang, further along to St. Wolfgang and Bad Ischl, our former emperor's Franz Joseph's favorite vacation spot (visit his former hunting lodge !). Further south the trail will lead you into the picturesque town Hallstatt. Don't miss taking a small boat out on the lake and enjoy one the country's best photo ops. Stop at the ice caver near Obertraun. Via the Traunsee, Attersee and Mondsee, all of which invite to some great water activities. The most prominent of all bike routes in Austria, this tour will take you some of Austria's most impressive cultural sites. Starting at the historic German Border town of Passau the trail follows the Danube River (Europe's second largest) into Vienna. The city of Linz, the baroque abbey of St. Florian and the many castles along the way and of course, the famous "Wachau" region with ist charming villages, vineyards and romantic fruit orchards. Don't miss a visit to the baroque abbey of Melk overlooking the Danube. The Spanish Riding School in Vienna is one of Austria's most known attractions. Please note that seating as well as standing room at the Imperial Palace Home of the Spanish Riding School is limited. An Austrian cultural institution, the Vienna Boys Choir can usually be heard Sunday mornings at the Imperial Palace Chapel and various concert performances. Numerous classical concerts with world renown orchestras and soloists in Anton Bruckners hometown. The Festival is ushered in each year by the Linz Cloud of Sounds. Famous opera performances on screen, masterful concert interpretations every evening under the stars with the splendid backdrop of Vienna's City Hall Free admission nightly during the summer months. The Vienna Festival concerts are the highlights of Vienna's concert season. The world's most renowned orchestras, conductors and soloists will be performing, among them in 2002: the Berlin Philharmonic Orchestra directed by Claudio Abbado and the Wiener Philharmoniker (Vienna Philharmonic Orchestra) directed by Sir Simon Rattle. One of the most famous opera houses in the world, program runs from September through June each year. This Benedictine Abbey was founded in 1089 and is a major representation of Austrian Baroque architecture. Melk Abbey is overlooking the Danube River and can easily be visited during any Wachau Valley excursions.